An homage to the man who built California's version of Venice. You can’t go anywhere in Venice Beach without seeing the ghost of developer and tobacco millionaire Abbott Kinney everywhere. Chat with the "Eternal Rookie" at a museum honoring African American Firefighters. Kinney made Venice, from the copycat canals to the circus-like atmosphere right down to the intricate carvings on pillars around town. 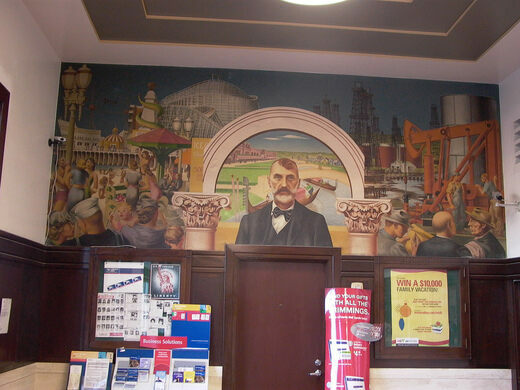 Kinney’s name and influence is in every nook and cranny, but the place that embodies the true spirit of the man who made Venice is the Historical Post Office, or rather the mural inside it. Edward Biberman was commissioned to paint the mural 70 years ago, and while it’s not the only giant likeness of the visionary founder in town, it’s definitely the most detailed. In it, Kinney stands in the center flanked by many of the institutions he had installed to make the quirky town unique, from the roller coasters and carousel of the pier to the oil derricks from the short-lived boom on Washington St. Behind him under an arch separate from the busy background is a serene picture of gondolas floating down the canals Kinney dredged out of the swampland he saw so much promise in. Embroiled in a custody battle between the USPS and the townspeople,the mural and the historical building in which it resides were in danger of being destroyed, but as of June 2012, it seems they have a savior. Film Producer Joel Silver has begun legal proceedings to buy the building, and has sworn to conserve the structure and it’s beloved mural, going so far as to sign a contract outlining the promise. A lonely Gondola stuck on a traffic circle sits in a spot where it once would have floated down the Grand Canal. From pre-war whiskey cocktails to prohibition-era speakeasy secrecy, this bar has seen it all. Legendary frontman of the Doors looms in this giant mural by famed Venice muralist, Rip Cronk. An historic and oft-filmed spot for musclebound iron pumpers on the Pacific coast. Part shoe store, part sociopolitical art gallery, part zoo. For 20 years, local pumpkins have met their fate on the iron fence surrounding this Cobble Hill home.